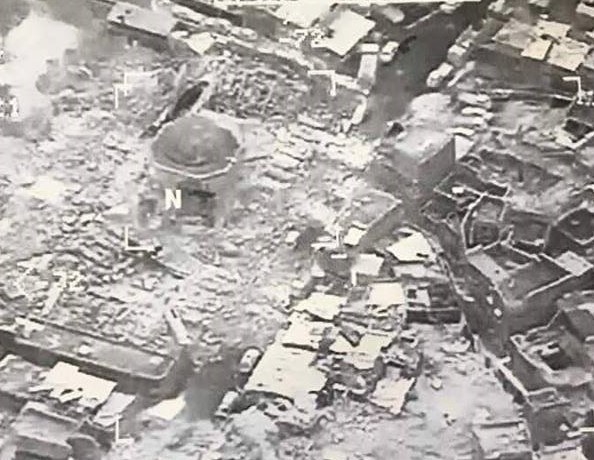 ISIS destroyed the historic Great Mosque of al-Nuri in Mosul on Wednesday, a landmark that had stood since the 12th century. The Iraqi government and the US-led coalition of Operation Inherent Resolve announced the mosque's destruction in a statement and attributed it to ISIS. A US official told BuzzFeed News that its initial review did not show any coalition airstrikes around the mosque in the last day. “As our Iraqi Security Force partners closed in on the al-Nuri mosque, ISIS destroyed one of Mosul and Iraq's great treasures,” said Maj. Gen. Joseph Martin, commanding general of Combined Joint Forces Land Component Command-Operation Inherent Resolve. Mosul has been a center of fighting since October, when Iraqi security forces and allies began a push to take it back from ISIS. Since then, the coalition has reclaimed more than 47,000 square kilometers of land, officials said. “This is a crime against the people of Mosul and all of Iraq, and is an example of why this brutal organization must be annihilated,” Martin said. “The responsibility of this devastation is laid firmly at the doorstep of ISIS, and we continue to support our Iraqi partners as they bring these terrorists to justice. The mosque — nicknamed Al-Habda or the hunchback — was known by its leaning minaret, which was ordered built in 1172 by Nur al-Din, a Muslim ruler and general who successfully fought against the Crusaders and conquered territory in the region. In 2014, as ISIS first overtook Mosul, militants killed the mosque's imam for refusing to join them. ISIS leader Abu Bakr al-Baghdadi then spoke at the mosque to declare a new caliphate, an attempt to tie the terrorist group to Muslim governments of the past. Throughout the region, ISIS has destroyed Muslim landmarks that do not align with its extremist views. Militants later in 2014 attempted to destroy Mosul's great mosque, the BBC reported. However, a crowd of Mosul residents formed a human chain around the minaret, and the militants backed down, the BBC reported. On Wednesday, one Mosul resident told BuzzFeed News the loss of the mosque was devastating to locals. “What should I say? Our old lady was killed on age of 900 years? Our identity was destroyed?” the Mosuli behind the MosulEye Twitter account told BuzzFeed News. BuzzFeed reporters Nancy Youssef and Mike Giglio contributed to this report.